Another top quality scale design from Nick Ziroli. Your Belair Parts Set includes all laser cut balsa and plywood parts, including ribs, bulkhead, formers, tip outlines, etc. Add you own strip and sheet wood. or we can supply a full kit, including every strip of wood. 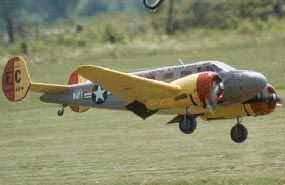 Belair Models can also supply all genuine Ziroli accessories, such as the cowl, canopy, dummy engine and the custom Robart retracts. Specifications: Scale 2.4 inches to 1 foot, Wingspan 114 inches, Length 80 inches Wing Area: 1950 sq inches with an all up weight of approx. 40 lbs. Requires two 35-50cc petrol engines.